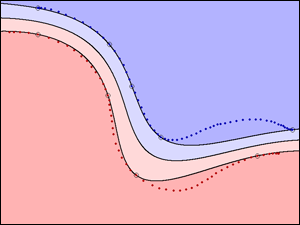 Non-linear decision boundary of a trained support vector machine (SVM) using a radial-basis function kernel. Fisher's linear discriminant analysis (LDA) of four different auditory scenes: speech, speech in noise, noise and music. 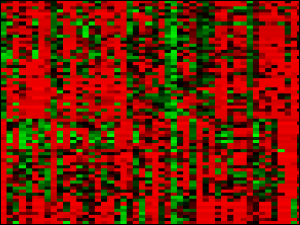 Gene expression levels obtained from a micro-array experiment, used in gene function prediction. Other related courses offered at the D-INFK include: Computational Intelligence Lab, Probabilistic Artificial Intelligence, Advanced Topics in Machine Learning, Information Retrieval, Data Mining. Typo corrected: the exam is 180 minutes, not 120. Lecture 15 (time series) added. Lecture 14 (mixture models) added. Added matlab skeleton for series 4. I'm sorry for inconvenience. Structured SVM tutorial 08 posted. Lecture 10 (structured SVM) updated. Lecture 9 (SVM) UPDATED (added slides 23+). Lecture 8 (perception) (added slides >23 with topic LDA). Lecture 8 UPDATED once more. Lecture 8 (perception) ADDED and UPDATED (slide 10). Solution to series 1 and tutorial 5 added. Sorry for a technical delay! Lecture 2 (Monday, 26th Sept) has been added. There are four exercise time slots each week. The assignment of participants to exercise sessions will follow your LAST NAMEs. Below you find the initial letter of your last names as well as the exercise session that you are assigned to. The tutorial classes will start as of the second week of the semester. Please note that all four sessions are identical. Some of the material can only be accessed with a valid nethz account. The exercise problems will contain theoretical Pen&Paper assignments. Please note that it is not mandatory to submit solutions, a Testat is not required in order to participate in the exam. We will publish exercise solutions after one week. Send a soft copy of the exercise to the respective teaching assistant for that exercise (specified on top of the exercise sheet). This can be latex, but also a simple scan or even a picture of a hand-written solution. Please do not submit hard copies of your solutions. Part of the coursework will be a project, carried out in groups of 3 students. The goal of this project is to get hands-on experience in machine learning tasks. The project grade will constitute 30% of the total grade. More details on the project will be given in the tutorials. The mode of examination is written, 180 minutes length. The language of examination is English. As written aids, you can bring two A4 pages (i.e. one A4 sheet of paper), either handwritten or 11 point minimum font size. The written exam will constitute at 70% of the total grade. To account for the scale of this course, we will answer questions regarding lectures exercises and projects on Piazza. To allow for optimal information flow, please ask your content-related questions on this platform (rather than via direct emails) and label them accordingly (e.g., by indicating which lecture / project your question refers to). In this manner, your question and our answer are visible to everyone. Consequently, please read existing question-answer pairs before asking new questions. C. Bishop. Pattern Recognition and Machine Learning. Springer 2007. This is an excellent introduction to machine learning that covers most topics which will be treated in the lecture. Contains lots of exercises, some with exemplary solutions. Available from ETH-HDB and ETH-INFK libraries. R. Duda, P. Hart, and D. Stork. Pattern Classification. John Wiley & Sons, second edition, 2001. The classic introduction to the field. An early edition is available online for students attending this class, the second edition is available from ETH-BIB and ETH-INFK libraries. T. Hastie, R. Tibshirani, and J. Friedman. 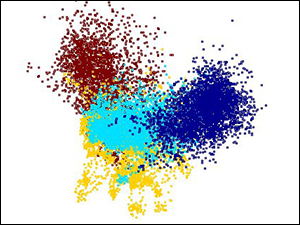 The Elements of Statistical Learning: Data Mining, Inference and Prediction. Springer, 2001. Another comprehensive text, written by three Stanford statisticians. Covers additive models and boosting in great detail. Available from ETH-BIB and ETH-INFK libraries. This book is a compact treatment of statistics that facilitates a deeper understanding of machine learning methods. Available from ETH-BIB and ETH-INFK libraries. D. Barber. Bayesian Reasoning and Machine Learning. Cambridge University Press, 2012. This book is a compact and extensive treatment of most topics. Available for personal use online: Link. K. Murphy. Machine Learning: A Probabilistic Perspective. MIT, 2012. Unified probabilistic introduction to machine learning. Available from ETH-BIB and ETH-INFK libraries. S. Shalev-Shwartz, and S. Ben-David. Understanding Machine Learning: From Theory to Algorithms. Cambridge University Press, 2014. This recent book covers the mathematical foundations of machine learning. Available for personal use online: Link. The official Matlab documentation is available online at the Mathworks website (also in printable form). If you have trouble accessing Matlab's built-in help function, you can use the online function reference on that page or use the command-line version (type help <function> at the prompt). There are several primers and tutorials on the web, a later edition of this one became the book Matlab Primer by T. Davis and K. Sigmon, CRC Press, 2005.